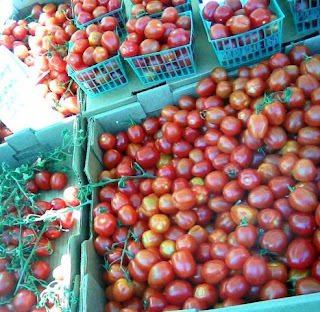 These tomatoes grow in clusters on the vine and have a shape similar to a strawberry. Besides being beautiful and delicious, they are an excellent source of Vitamin C, A, K and the powerful antioxidant, lycopene. I would love to tell tales of how I always enjoy tomatoes sliced with evoo, fresh cracked black pepper and a touch of Himalayan pink salt, however that's just not true. Though I've prepared them that way before and thoroughly enjoyed it, these beauties rarely make it past the passenger seat of my car. It's an addiction. The funny thing is I never liked eating tomatoes straight up until I started purchasing the many varieties I find at Farmers Markets. Now, I simply cannot get enough! This time I thought ahead and purchased some extra, along with some asparagus, fingerling potatoes and fresh herbs. Sounds like a delicious dinner to me!